It's been said that Delhi is a city of cities in itself. We were reminded of this when we entered a gate leading to a duo of tombs known as the ‘Dadi - Poti’ tombs. Dadi - Poti translates to grandmother- granddaughter. It’s not known for sure if these tombs actually belonged to a grandmother or her granddaughter; in fact, who remains buried here is still an unanswered mystery. The names were simply given to identify the adjacent large and small structures. 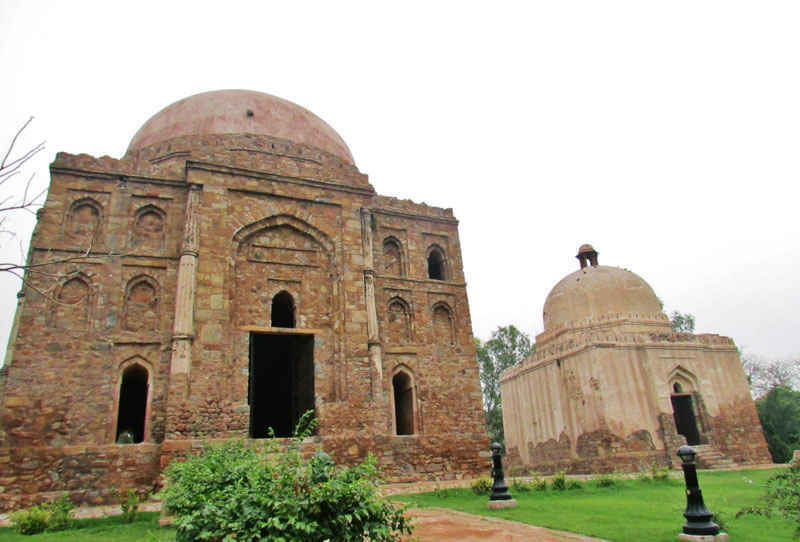 The Dadi and Poti tombs belong to the Lodhi (1451 - 1526 AD) and Tughlaq (1321 - 1414 AD) periods respectively. 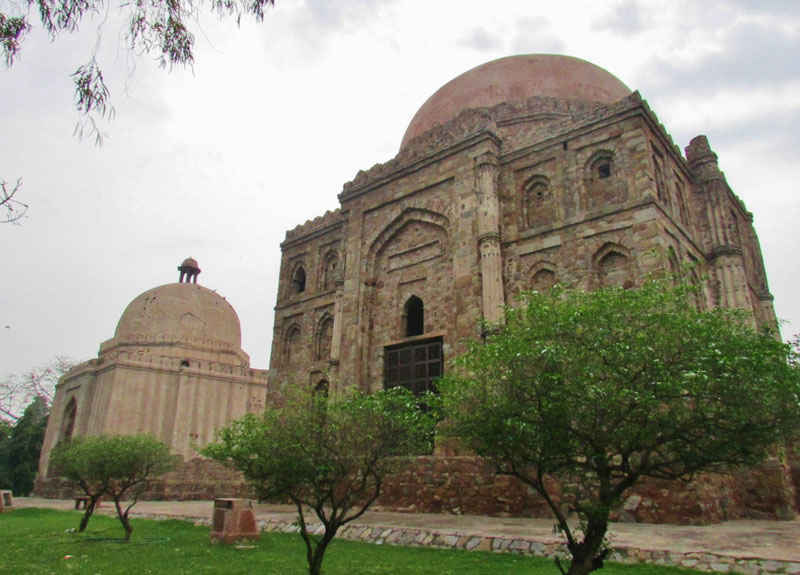 The ‘Dadi’ tomb is larger and probably the grandest of those found in the Green Park area. It gives the appearance of being two-storeyed, with arched window-like designs on different levels of its walls. Spaced about twenty feet apart, the ‘Poti’ tomb is the smaller and less impressive of the two. On careful observation, we noticed that it had gently sloping walls. Also, something we don’t usually see built on the top of a tomb - there's a lantern like structure on its dome. Traditionally, the entrance to a tomb is at the Southern face but here we see an ornate Northern entrance. 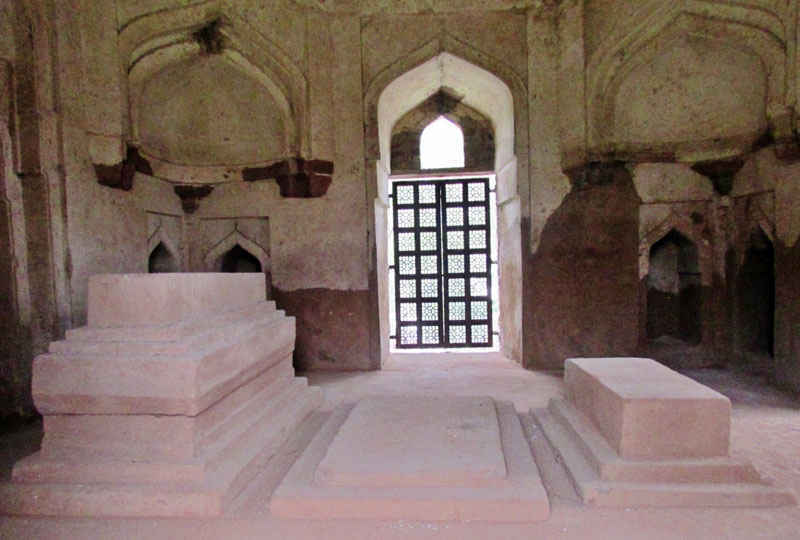 Inside the Dadi Tomb is a spacious room containing six cenotaphs. In a much smaller space in the Poti Tomb are three other cenotaphs. The graves are made of stone and not marble finished. The ceiling of the Poti Tomb is plain unlike that of the Dadi Tomb which has some Quranic inscriptions on it. Come nightfall, these uncanny set of tombs are illuminated with colours like purple, blue or yellow. This is a welcome sight when arriving at Hauz Khas Village. They are surrounded by a well-maintained garden inside and the usual manic roads filled with traffic outside. Some faces of the tombs are slowly wearing out and turning to rubble. The size and design of the larger tomb suggests that it belongs to someone who was relatively significant. Since the tombs were constructed beside each other we can infer that there was some relation between the people buried in them however, the legend and history behind this remains a mystery. Also, you can find monuments like Barah Khamba and Feroz Shah’s Tomb, not far from here. It is doubtful that anyone on their way to Hauz Khas Village would not have noticed these prominent structures from another era. The tombs are situated in the Green Park area, 5 minutes away from the metro station. If you’re up to it, one can take a 15 minute walk along the main road and turn right just before Aurobindo Market, towards the road leading to Hauz Khas Village. The tombs would then appear in plain sight. Entry is allowed between sunrise and sunset; the tombs and the surrounding garden prove to be a peaceful and uncrowded space as we are left to ponder over why these tombs, belonging to different times, were built this way. History can truly be intriguing at times!